This is the first cupcake I have ever made, of course not the first one I have ever eaten. Last month, I bought a book about cupcakes thinking that after my holidays in Bulgaria I should try to bake some of them. The original recipe is withdrawn from “Sensational cupcakes” by Alisa Morov. Mix the cocoa powder and boiling water together in small bowl, until the cocoa powder has dissolved completely. Mix the eggs, a quarter of the cocoa mixture and the vanilla extract together. In a large mixing bowl, combine the chopped mixed nuts, the flour, the baking powder and the sugar. Whisk slowly and add the butter and the remaining cocoa mixture. Beat slowly until all the dry ingredients are moist. Then add the egg mixture in two batches, beating for 30 seconds after each addition. Line the cupcakes moulds with paper cases and fill to halway. Bake for 20 – 25 minutes. The cupcakes will rise while baking and fall back a bit while cooling. For the peanut butter butercream, mix the peanut butter and butter together slowly until well combined. Gradually add the sugar and mix well. Decorate the cakes using a piping bag without a nozzle. I really found this recipe easy and it is so yummy so I will probably try some other ones from this book. 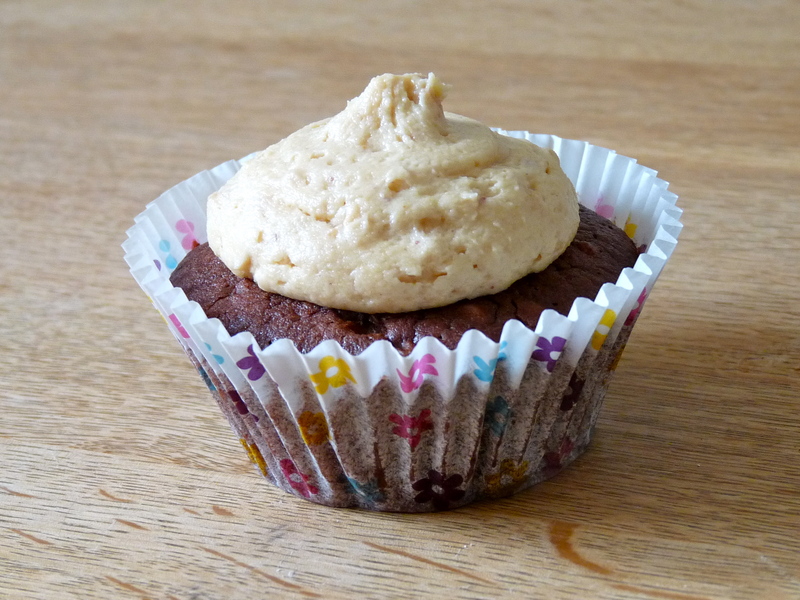 This entry was posted in Cupcakes, Recipes and tagged Chocolate brownie, cupcake, peanut butter by thebloodyfrog. Bookmark the permalink.